This past summer, during our publishing break, we took some time to reflect on the past few years of In geveb’s work. We are proud that in three years we have grown from a fledgling website to a significant resource for scholars, learners, and lovers of Yiddish Studies the world over. We have published dozens of contributions from translations to teaching guides, from book reviews to blog posts, from peer reviewed articles to Purim jokes, each with the aim of furthering an expansive and dynamic vision of the field of Yiddish Studies. But we know there’s a lot of work still to do to bring you the ideas, knowledge, and community you want and need. That’s why we recently asked our readers to participate in a reader’s survey to help us reflect on what we’ve accomplished and how we can continue to grow. Although the responses to our survey were plentiful, they represent only a fragment of our readership. So we’re sharing the results with you in the hopes of sparking further conversation. If there’s criticism or praise here that you agree with, please let us know. And if the ideas discussed here inspire you to send us your work, or to suggest items we should publish, please write to us. Our readers noted our diverse content, which, as one reader explained, serves “different publics.” Indeed, our readers are independent learners, students, instructors, and scholars. They are young and old, native speakers of Yiddish and Yiddish-curious English readers. They are rabbis, actors, musicians and activists. And we hope, and try, to meet all of their needs. There’s a lot to love about In geveb. Our readers praise our bilingual translations. Their only regret is that there aren’t more of them. They love reading treasures and gems that are obscure or undertranslated, listing with exclamation marks their favorite translations of the past years: Jordan Finkin’s translation of Leyzer Volf’s Evigingo! Arthur Green and Ariel Evan Mayse’s translations of Hillel Zeitlin’s writings! Adi Mehalel’s translation of Jacob Glatstein’s poem “Qibya”! Michael Shapiro’s translation of Yosl Cotler’s “The Dybbuk in the Form of a Crisis”! Ri J. Turner’s translation of the biography of Rabbi Shmuel Tamares! 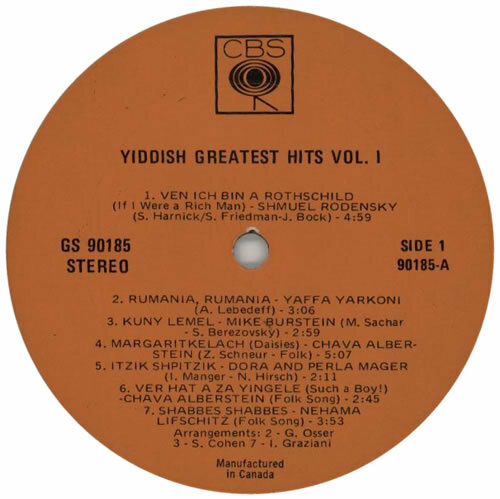 And one reader said their favorite publication in In geveb history was Daniel Kennedy’s lively discussion of the difficulties of Yiddish translation. Image of a text for In geveb undergoing editing - a sneak peak into our “pleasant” editorial process. Those readers who turn to us for coverage of the Yiddish(ist) beat love our essays and interviews, especially Tova Benjamin’s “reviews of things in the Yiddish world” and Anna Elena Torres’ interviews with Ezra Berkley Nepon and Yevgeniy Fiks. But they feel we’re sometimes inconsistent with what we decide to cover and with how much we keep on top of events and performances around the world. Our industrious editors try to keep abreast of the latest in global Yiddish happenings, but we also rely on our readers (and our Yiddish Google Alerts) to keep us informed. If there’s something happening near you that you think we should be writing about, send us an email. We found that our readers use and care about our pedagogy section. 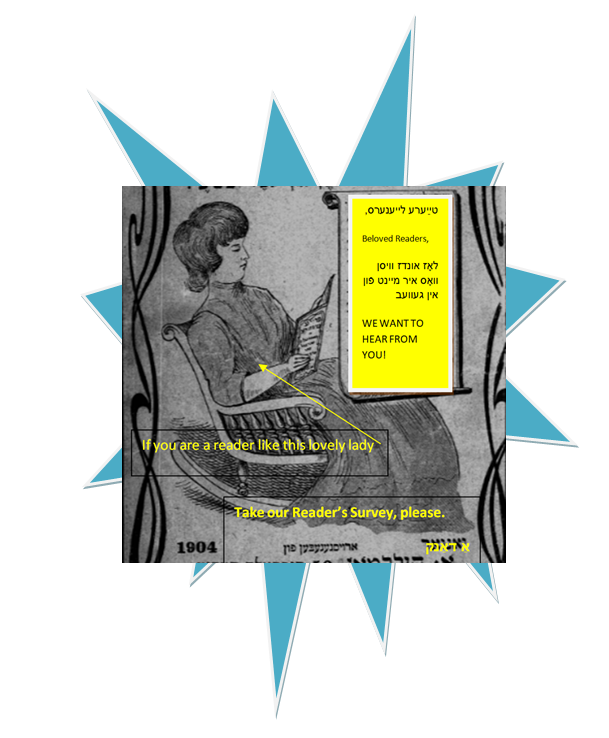 They share our summer programs round up with their reading groups and classes, and several readers asked for more of the teaching guides that make our site a user-friendly and pragmatic place to turn for an educator in a pinch. One reader told us that our roundup of opinions about College Yiddish was one of their favorite pieces, while another praised Zachary M. Baker’s Resources in Yiddish Studies series as a go-to resource for academic work in our field. Nevertheless, some readers find the pedagogy section frustrating because of its broad focus. They’d like to see more discussion of second language aquisition, more foreign language teaching metholdologies, more exercises for the language classroom. Never fear! In geveb is looking forward to publishing more about Yiddish language pedagogy in the coming months, and we are always eager for submissions that address the nuts and bolts of teaching language. Several readers expressed that they wished there was more Yiddish content on the site. This is a conversation that we have often in our editorial staff as we balance the work that we put into the Yiddish we publish - which is standardized, transcribed, and meticulously copy edited and of course translated - with the ultimate result of providing robust Yiddish-language reading material and building community around Yiddish. For reasons of accessibility and reach, In geveb is an English-language publication, so for the time being we will always publish Yiddish material with an English translation. Our readers have many exciting ideas for possible new directions for our publication, and we’re grateful for your enthusiasm and your suggestions. Our readers would like us to include original literature, to expand our coverage of Hasidic texts and communities, and to collaborate with other digital Yiddish initiatives. They also ask us to consider audiences outside the academic orbit, especially those in “the wider space of the yiddish cultural revitalization.” This includes providing support for Yiddish clubs and organizations, or some kind of platform for these institutions to share resources and ideas with one another. One reader suggested that we consider “moving towards being a place where polemics (and ongoing back-and-forths) can happen.” They ask for In geveb to encourage writing that expresses strong opinions, and to allow its pages to be places for earnest and passionate debate. We can’t promise that we’ll take on every one of these suggestions at once, but know that we do take them seriously. We are constantly working to keep In geveb fresh and innovative, and that work includes listening to and attentively considering readers’ ideas. We used this image to encourage our social media followers to participate in the survey. Did it entice you? 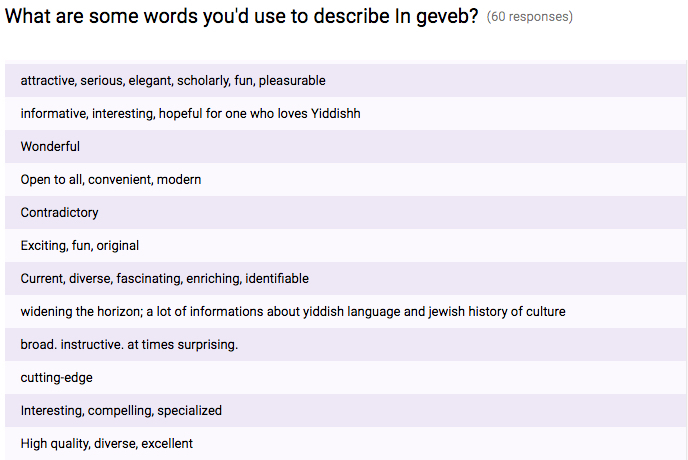 Last but not least, our readers have strong feelings about In geveb’s Purim issues. Our “Purim Torah” on machine learning and translation was a hit, but one reader emphatically stated that their least favorite piece in all of In geveb was our “absurdly self-referential teacher’s guide from Purim Week.” To that criticism all we can say is, yes, that is a very accurate description. We agree. Despite these criticisms, we are gratified that our readers enjoy our “energy and plenitude,” the “quality of writing” and the “unimpeachable aesthetics.” Readers, here’s to another year, with plenty more to come. Editors, The . 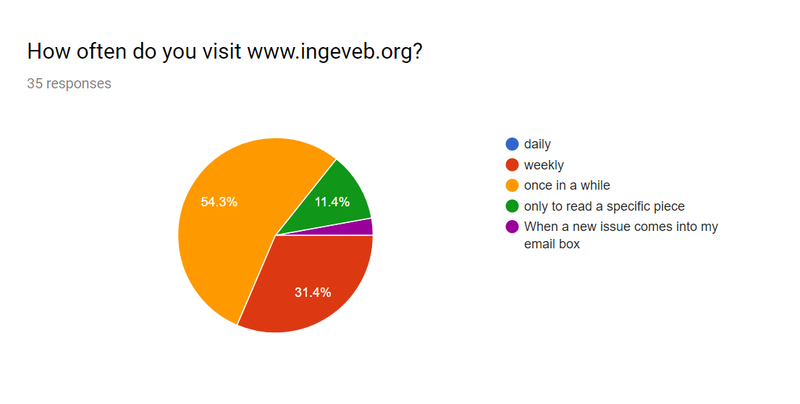 “לויט די לייענערס | Readers Respond.” In geveb, October 2018: https://ingeveb.org/blog/לויט-די-לייענערס-readers-respond. Editors, The . “לויט די לייענערס | Readers Respond.” In geveb (October 2018): Accessed Apr 22, 2019. This summer we conducted a survey of our readers to find out what you think about us, here’s what we learned.